Kyrgyzstan's President Kurmanbek Bakiev has accepted the resignation of his Cabinet and appointed Prime Minister Felix Kulov acting premier. The deputy speaker of the Kyrgyz parliament says the resignation of all 19 government ministers may provoke fresh tensions in the country. Prime Minister Felix Kulov believes the president's decision to accept the resignation was made to avoid a power struggle in the country. It is in line with the new Constitution. President Kurmanbek Bakiev asked all Cabinet members to perform their duties until the formation of the new government. Mr Bakiev couldn't say how long this would take. The government's decision is seen as an unexpected move by most Kyrgyzs. 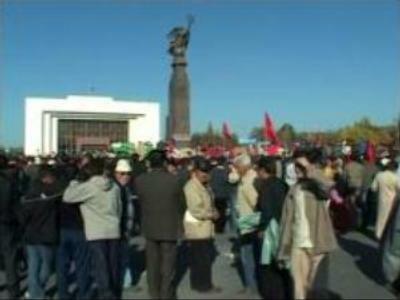 Some politicians and analysts did not expect much political activity in Kyrgyzstan until the end of 2006. Just weeks after the stand-off of the parliament and President Kurmanbek Bakiev the political situation seems to be returning to uncertainty. In November, a week after the protests, the Kyrgyz parliament approved amendments to the Constitution curtailing the president's power and giving more authority to the Cabinet and the parliament. The adoption of the new Constitution meant the beginning of a new era for Kyrgyzstan. The ministers will be appointed by the prime minister who, in his turn, will be picked out by members of the leading political party. It may take weeks for the new ministers to be appointed, but most observers agree that it's in the best interests of both the president and the opposition to form a new government as soon as possible. “We witness another lap on growing tension in the country. In the near future more tension seems to me still more probable, but let’s hope this growing tension will remain within the framework of the political elite and will not result in street protests,” declared Vladimir Zharikhin, Deputy Chairman of the CIS Institute.